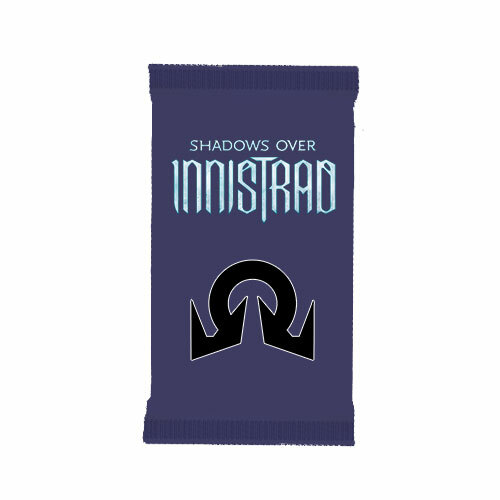 Shadows Over Innistrad booster packs contain 15 cards each. Shadows over Innistrad is the 70th Magic expansion, and the first in the Shadows over Innistrad block. It will be released on April 8, 2016, and be a large expansion. Shadows over Innistrad returns to the gothic horror themed plane of Innistrad. The expansion symbol of the set is an upside down reflection of Avacyn's symbol. The set features the same tribal components as the Innistrad block with the five main tribes each being split over an allied color pair. Spirits primarily in white and blue, Zombies in blue and black, Vampires in black and red, Werewolves in red and green, and Humans primarily in green and white. Innistrad contains 297 cards (X basic lands, X commons, X uncommons, X rares, X mythic rares), including randomly inserted premium versions of all cards in the set. This is about 25 cards more than other recent large expansions in recent history. Shadows over Innistrad also sees the return of double-faced cards which have a card frame printed on each side, and a checklist card used to prevent decks from becoming marked by containing them. The checklist card replaces the basic land in some boosters. Innistrad is a world beset by terrible evils on all sides and betrayed by the hope it held most dear. Avacyn has finally returned, but what new evils have come with her? Madness is plaguing the inhabitants. Terror falls from the skies on blood-spattered wings and nameless horrors lurk in the shadows. The planeswalkers of the Gatewatch investigate its dark mysteries. Meanwhile, Sorin is in search of the whereabouts of Nahiri.